Most of the time, the crafts on the site don't require much in the way of store bought materials. But Lisa Ann asked whether I knew where she might find printable Shrinky Dink patterns. I couldn't find anything on the internet so decided to put some together for her. If you ever want to make your own, six images per page works out to be about the right size for necklaces or keychains. The images shrink to 1/3 of their original size. Position the shrinky dink blank overtop of the printout (whichever image you want). 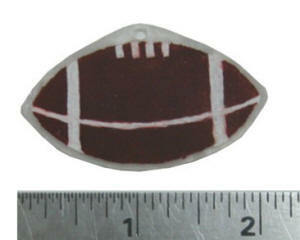 The shrinky dink material should be positioned smooth side down/rough side up. trace the image with a black pencil crayon (you should be writing on the rough side of the material) -- you can trace with an ordinary pencil, but I find it smudges easier than the pencil crayon does. Color the image in with pencil crayons (make sure you color white areas in with a white pencil crayon!). Cut out the shrinky dink -- I always leave a border of uncolored material around the image. In other words I cut it out roughly (without sharp corners) as I find the sharper edges break off easier. hole punch the top of the shrinky dink (if you're planning to make a necklace or keychain). Place the shrinky dink on a cookie sheet or Aluminum foil pie plate with the rough side up and the smooth side down. Put it in the oven (have the oven light on) and WATCH IT SHRINK. It goes really quick (under a minute). It will curl up and then flatten out. Let the piece flatten and then wait 30 seconds. Remove from the oven. Notes: You can buy all sorts of odd things like special shrinky dink markers and a special oven (that looks a bit like an easy bake oven). But I find pencil crayons, a Aluminum foil pie plate and my oven work just fine. Please don't use water soluble markers or wax crayons to color the shrinky dinks ... They don't work. Regular school pencil crayons do work just fine. "Another thing that works great for the Shrinky Dinks instead of the oven is a craft heat gun. I've used that and it works really good!"